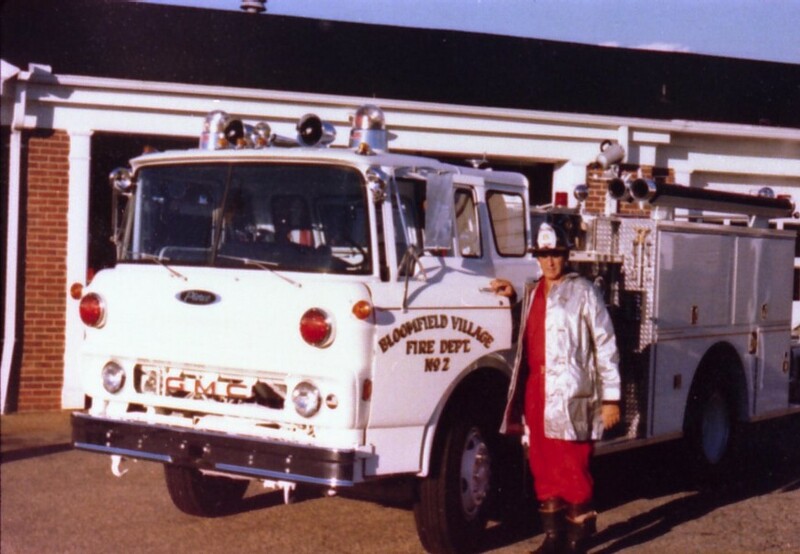 The creation of the Bloomfield Village Volunteer Fire Department begins over 70 years in 1938. At that time the developer of Bloomfield Village, Judson Bradway, petitioned the state licensing bureaus to allow the Birmingham Fire Department to handle fire runs within the village limits. The state agreed but the residents of Bloomfield Village would have pay mileage and a flat fee for each fire run that Birmingham made. Birmingham was in favor of this concept since they could refill their pumper trucks from the pond located in the undeveloped Indian Mound area of Bloomfield Village. While he agreed in principal with this arrangement, Judson Bradway felt that this was somewhat unfair to the residents of Bloomfield Village to be charged for the service, so he continued to look at other options. By late 1940, with World War II looming on the horizon, the residents of Bloomfield Village realized the need to protect their own property and not have to depend on someone else. This led to the creation of the Bloomfield Village Protective Association in late 1940. The motto of the newly created association was 'Progress not Profit'. The initial duties of the association were two fold; air raid wardens and a security system primarily for fighting fires. Special funding was secured through the state, with the assistance of Bloomfield Township, which did not have a formal fire department at that time. This funding along with the help of some GM executives who lived in the village allowed them to purchase a military 6X6 truck chassis in 1941. That chassis was converted into the first fire fighting vehicle for the department. The funding also allowed for training of the department members by the Birmingham Fire Department. The association's roster was comprised of 14 men which was quite remarkable since at that time there were only 166 homes in all of Bloomfield Village. The truck was housed in a 15 X 28 foot space in an old barn owned by Judson Bradway. The barn had a gravel floor and no heat and when the ground was wet it became difficult to get the truck out. Therefore, members of the department would take 'Old Betsy' as the fire truck was affectionately known, home with them and park it in their respective driveways from time to time. This practice made it much easier for a quicker response to fire emergencies. The Bloomfield Village Protective Association also entered into mutual assistance fire fighting contracts with Birmingham, Bloomfield Hills and Bloomfield Township. Over the coming years the Bloomfield Village Protective Association would be called upon to assist other fire departments throughout southeastern Oakland County. The picture shown here, taken in early 1942, shows the barn, which was located on the site of the current Village Knoll shopping center. Also in that picture, along with the fire truck 'Old Betsy', are the first members of the Bloomfield Village Protective Association and some of the Bloomfield Village Trustees at that time. Information used in this article was taken from a speech given by the then Village Manager, Charlie Williams during the Annual Fire Department Appreciation Dinner at the Birmingham Athletic Club on March 7, 1990. Mr. Homer Phillips was a Bloomfield Village Volunteer Firefighter from the 1970's. He lived on Hupp Cross, Glengarry and Indian Mound Trail when he was active on this department. He is now moving to Florida and while he was cleaning up he found his old fire helmet. He thought the Village Fire Department would like to have it and he was correct.. Thanks for saving this history. The Fire Department will proudly display this helmet during their Fire Department Open House in October. I came across the BVFD Web site and it brought back very fond memories to me. My name is Mike Baldez and I lived in the Village from 1940 to 1959. My father was Joseph P. Baldez and we lived at 407 N.Williamsbury Rd. and he was a staunch member of the Bloomfield Fire Protection Association. I still have his beer stein he received for his service in 1959. I remember my dad had installed a siren under the hood of his car and would use this to respond to calls. The web site refers to "Old Betsy", on Saturdays; I would ride with him when he would take the truck to Bloomfield Township Fire for fuel. The Monday night fire drills were a thrill for all the people, which lived in the Village, being able to watch the volunteers practice. One such night, my mother was not too thrilled about, but they used our house for a drill, but we kids thought it was great. They put a ladder up to my brother’s room and practiced search and rescue. 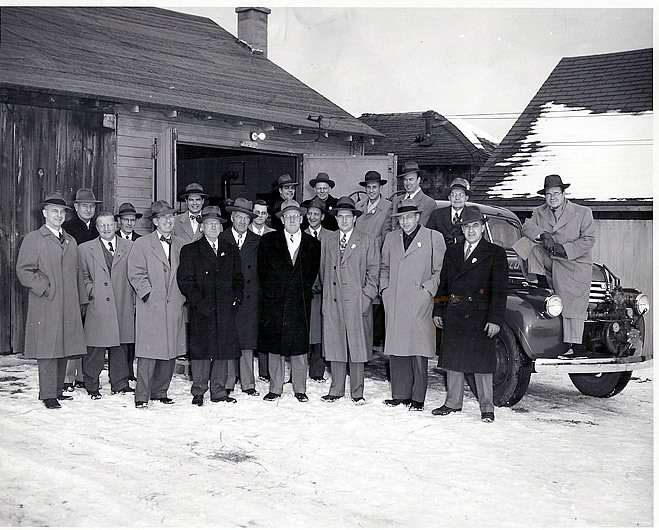 On the BVFD web site, under the "History" tag there is a group picture and my father is the gentlemen in the first row in front of the right tire of "Old Betsy", he is wearing the black over coat. His dedication to the volunteer fire service inspired me to become a volunteer and answer the call. We moved from Michigan in 1961 to Bethesda MD outside Washington D.C., where subsequently I joined a volunteer rescue squad in 1963. (Bethesda Chevy Chase Rescue Squad BCCRS.ORG), I am a life member of the Squad and it is still one of the last remaining all volunteer organizations in Montgomery County MD. I presently live in Phoenix Arizona, I always think of how watching my father as a volunteer fireman shaped my life and thank God for all the volunteers around the United States for their time and effort. "Jim Vernor and Deirdre Conway after a Monday night training session sometime in 1989." 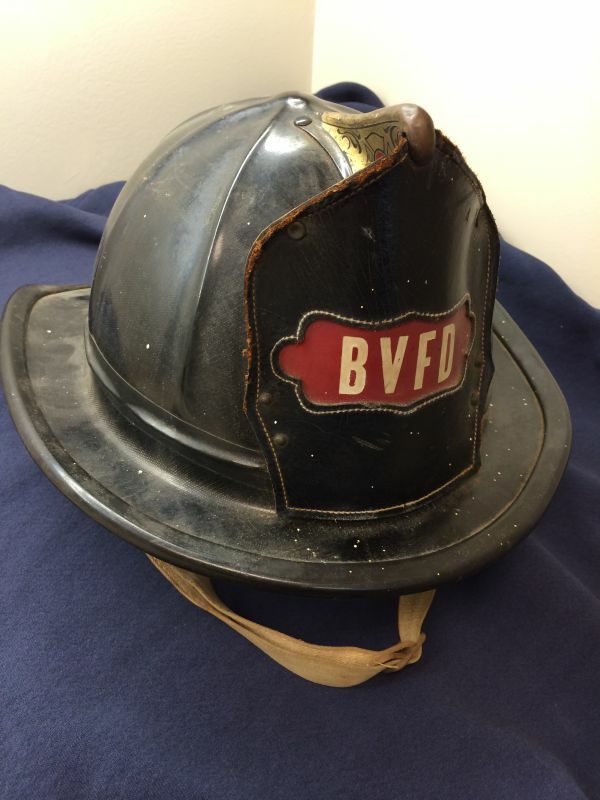 John Nyland's son Scott stumbled upon the BVFD website and shared this photo with us and a story written by the Detroit News from the mid to late 70's. We would love to have any stories or old pictures that you may have about our fire department history. Scott stated, 'Many of the old department members routinely got together as an annual tradition down in Florida in the 90's and early 2000's since most had chosen to move south for warmer weather. Father time has caught up however and many from that era have passed away'. If you were a member of our department, please let us know and we would be happy to keep you posted on our activities. It's executive action when volunteer firefighters roll out on a call from Bloomfield village, an affluent subdivision in Oakland County. The unique force, comprised of a doctor, dentists, automotive engineers and other professionals, handle the fire calls within the one-square mile subdivision in Bloomfield Township. 'Every time our trucks go out, they have a couple million dollars worth of talent on them', said John J. Ahern, director of security for GM. who serves as president of the Bloomfield Village Association board of trustees. The volunteer force was founded in 1942, when a large portion of the subdivision was farmland and orchards where magnificent two-story colonial homes now stand, ranging in value up from $80,000. THE VILLAGE residents have continued the operation of their own fire and police department, which includes a fire engine, a ladder truck and pumper along with two police cars. Village residents finance the services through an extra $100 a year in taxes. 'We look upon it a being a good neighbor proposition,' Ahern said. The volunteer force handles calls rangining from house fires to downed power lines within the 1,000 home subdivision. Heading the volunteer force is John R. Nyland, president of the metal and automotive products division of Indian Head. Nyland said there is a lot of comaradarie among the 25 men and five officers on the volunteer fire force, who show up three nights a month for drills, and go through a rigorous training course to qualify. As far as the attraction for fire fighting. Nyland said with a smile. 'I guess all men like fire engines'. Working with the volunteer force also gives the men an opportunity to switch occupational roles. 'We were out at a fire when one of the men hurt his hand, but when we looked around for the doctor, he was up on the roof,' Nyland said. THE VILLAGE also employs a paid professional fireman who mans the station from 8 to 5 Monday through Friday, and its five man police force are also paid professionals. The dispatching work for the village's departments and handled through the Bloomfield Township, and the firefighting volunteers have monitor radios set up in their homes.